CHICAGO (WLS) -- The largest dinosaur ever discovered is heading to The Field Museum's entrance hall, and Sue the T. rex will be moving to her own new space, in celebration of the museum's 125th anniversary in 2018. 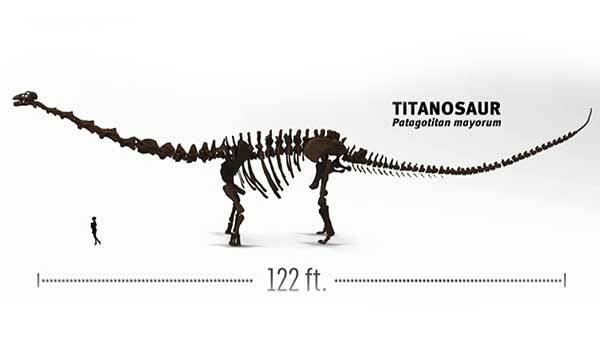 The dinosaur will be a cast made from the fossil bones of a titanosaur, a giant, long-necked herbivore from Argentina. The dinosaur will be 122 feet long from snout to tail, longer than two accordion CTA buses from front to end, The Field Museum said. The titanosaur will sit in the museum's entrance hall, Stanley Field Hall, the previous home of Sue the T. rex. Visitors walking around on the second floor balcony will be at eye level with the dinosaur. On the first floor, visitors will be able to touch the dinosaur and walk underneath it, museum officials said. Sue the T. rex, the world's largest T. rex, will move to The Griffin Halls of Evolving Planet. Sue will also be updated to reflect new discoveries regarding tyrannosaurs in the years since she was mounted. Her gastralia, a set of bones across her belly resembling a rib cage, will be added to her skeleton. The new body will be on display in 2019.